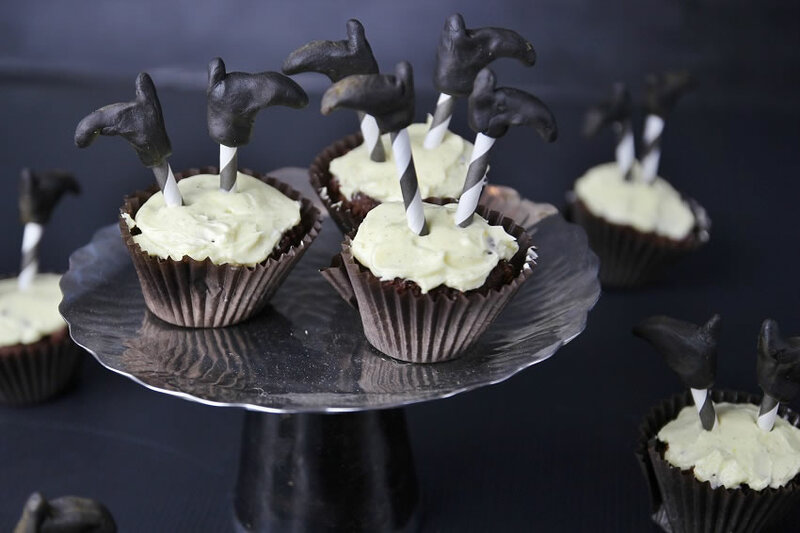 These are more than Chocolate Halloween Cupcakes. 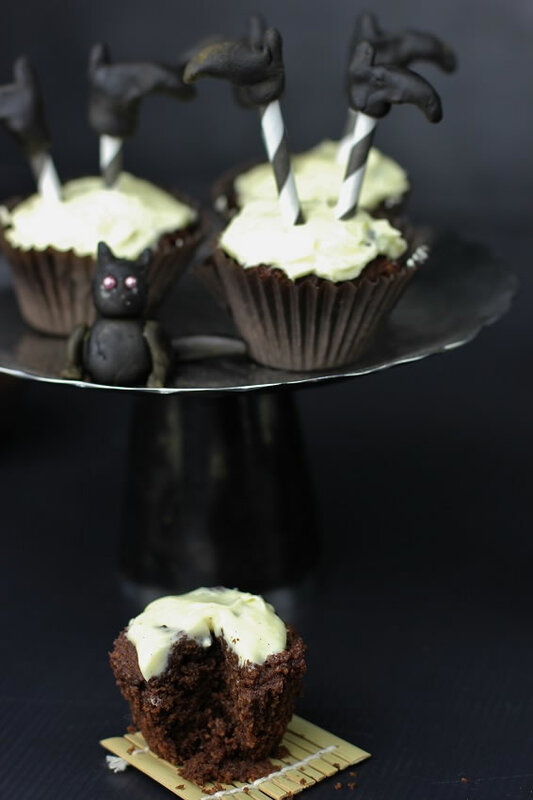 They’re witch Cupcakes and they’re both easy AND gluten free. On the wrong side of 40 something clicks in your brain and you just don’t care anymore. It’s a short and slippery slope from here in and I am afraid that I want to have a laugh as I slide my way into the never never. Didn’t you always wonder why the older people in the family relished a wedding or a BBQ or a gathering and reunion. It is an old saying that fun is wasted on the young and it’s true. By the time you really start looking forward to social events that’s about the time they seem to dry up. I was invited to a Christmas BBQ. It was billed on the invitation as a “Retro Party” which of course means you dress up, doesn’t it? My sister “Le-Le” was visiting and she also loves a bit of fun (must be a family trait), and while out and about making nuisances of ourselves she helped me assemble a costume from treasures at the second hand store and reclaimed items in my wardrobe. This gave us hours of entertainment snickering and laughing at the various additions to my costume, playing the music to match and making memories that we can refer back to when I tell you what happened next. It was a warm day and everyone was out at the pool when I arrived late. I met several other party goers at the front door, who were looking just like themselves – in jeans and tee-shirts, they looked at me with surprise but said nothing as we entered the house. I felt that was a bit worrying as I walked up a set of stairs and down a long straight walk way with the pool on one side and the garden fence on the other. Everyone was up under a tree in the far corner and all stopped talking to stare at me as I walked towards them dressed as Madonna with my fishnet singlet, headscarf, heavy make up, black boots and skirt. All that could be heard was the jangling of my crucifixes and chain belts. As I approached the group I could see that not one other person had bothered to dress up. What on earth do you do with a situation like that?. When your heart stops beating out of your chest and you just wanna’ have fun ……you ask where the hell your drink is…? 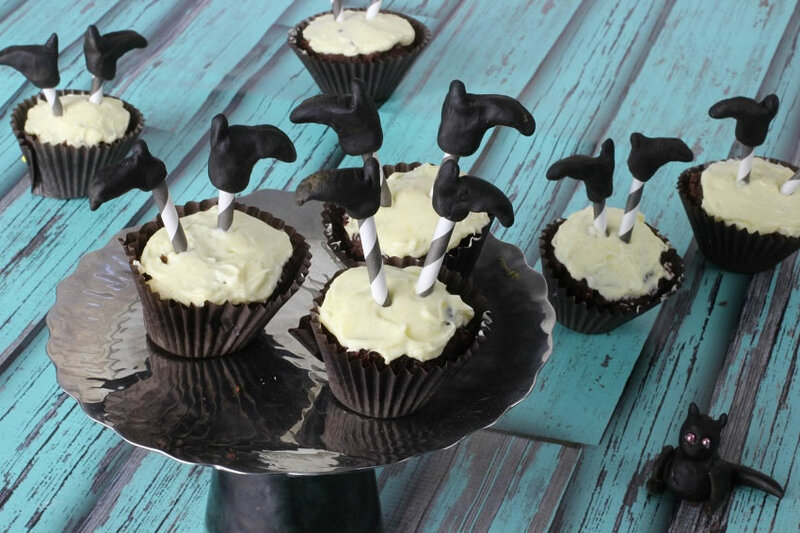 These cupcakes are a bit of fun too. Although they are not really all that original they are a laugh. 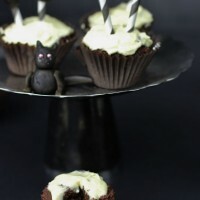 I had some left over cupcakes and icing from another cake I was making so put these together as a quick Halloween fix. I do hope that if you dress up at Halloween you won’t be the only fun one in the room. Beat the softened butter till light and add the caster sugar and keep beating till white and fluffy. Add the eggs one at a time then the sifted cocoa and baking powder then the almond or hazelnut flour (or alternative) and then the milk. Beat well to combine and fluff and then divide into cupcake papers. The mixture only rises a very small amount, so you can fill to just below the top. Beat the second lot of softened butter till light then add the softened cream cheese and beat again. Add very finely grated lemon zest and lemon juice the gradually add sifted pure icing sugar 1/2 at a time. Taste, if you like it sweeter add a little bit, more sugar (up to 1/4 cup) and beat well. Put into a pipping bag or spread icing onto cooled cakes. You can make the boots by moulding the soft liquorice into shoe shapes with your hands. Use a pointy object like a skewer to make enough of a round whole to slot the straw into the boot. Well that just means you were the only fun one there! How boring that no one else dressed up. I’d be right there with you, I love a dress up party! Gorgeous cupcakes. They’re original to me. Hahaha……awww you poor thing! How mortifying! Are the cupcakes a reflection of you wishing the earth would swallow you up head first at that moment? These are wonderful – especially the boots! Oh my goodness Tania! You’ve lived my absolute worst nightmare! I wouldn’t have been brave enough to head for the wine, I would have gone home to change 🙂 Agreed though. Who has a ‘retro’ party without dressups?! Gorgeous cakes. I love your cupcakes. I. want. one. 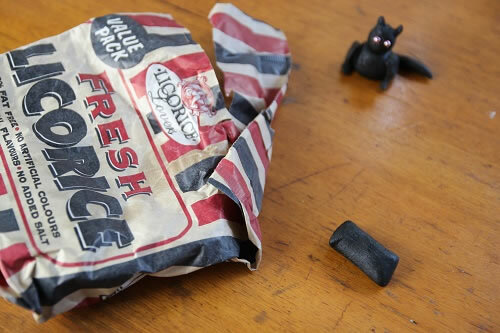 Oh I had to giggle at your story – in my opinion if you go to a fancy dress party you shouldn’t be allowed in without a costume (or you should be given something ridiculous to wear once you arrive ;D) Love the cakes and I’m so impressed at the boots made from licorice – great tip!! I absolutely abhor fancy dress parties and you’ve just given me another reason to do so – the fear that no-one else will dress up. I’ll bet you were keen to get that first drink down. Amanda (@lambsearshoney) recently posted..A Canadian Lobster-palooza! Totally love the witches feet, so very cute indeed! The straws are a great idea. I was in a similar situation once. I guess I didn’t get the memo. Thankfully, another was in the same predicament and we ended up hanging together. At least each of us knew the other was of the same mind. Wish we had these cupcakes. Every thing’s better when accompanied by a tasty cupcake. Burn her! Burn her! She’s a witch! 🙂 Your cupcakes are seriously cute love, as would you have been dressed as Madonna. Did you have a blonde wig on? I just love these; they are so cute! 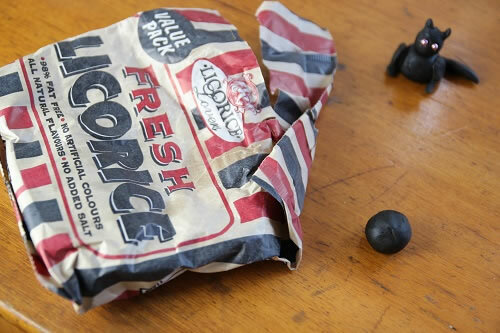 And I didn’t know you could do that to liquorice either. Thanks for sharing! …as for he retro party, you’re hanging with the wrong crowd, we party AND love dress ups, it is so lame to turn up to a them party and not make an effort. Good on you !! Guilty as charged. I’m afraid I’d be the one in jeans looking like me. Love the cupcakes though, they’re very cute! 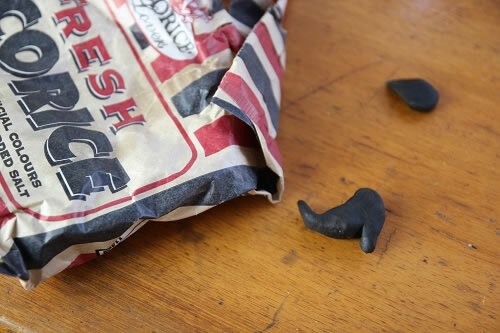 And I never knew you could mould liquorish what a great idea! G’day Tania! 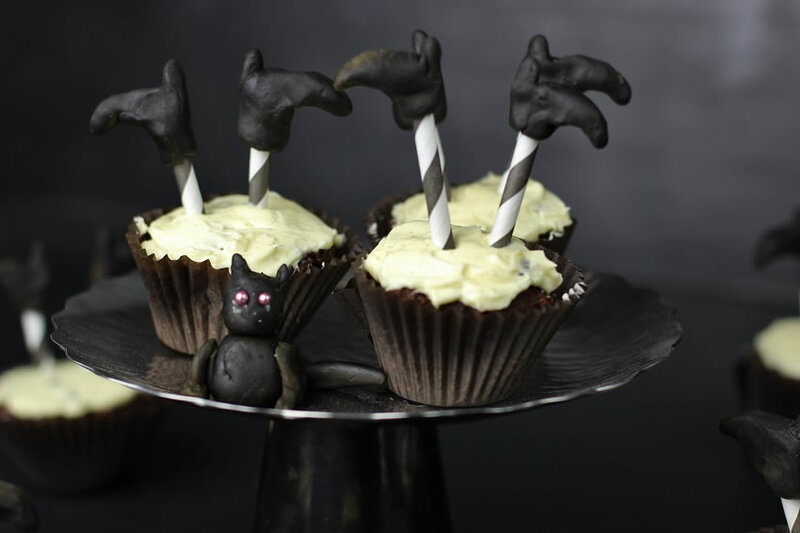 love your Halloween cupcakes, true!